You are currently browsing the tag archive for the ‘deck stairs for small spaces’ tag. Home Channel News recently announced that Trex, a leading manufacturer in the decking industry, has officially introduced and is now offering a spiral deck stair collection in the Trex product-line. 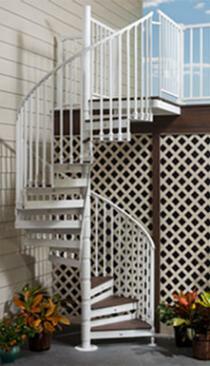 Outdoor spiral deck stairs are a fantastic alternative to traditional deck stair design because spiral stairs are not only an attractive design element, but they are a functional space-saving feature for tight-spots.